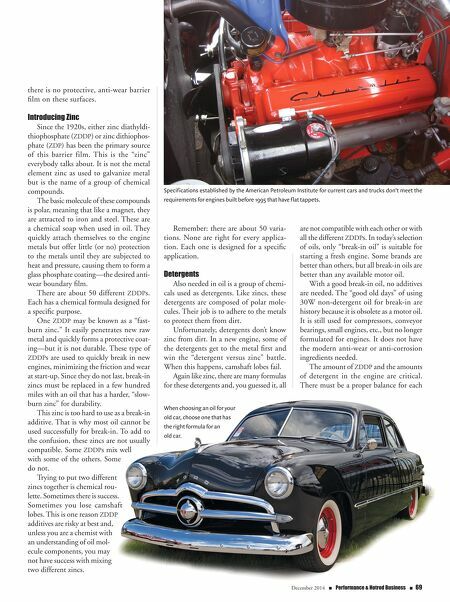 HOTROD Editor's Note: this is Part 4 of a series of articles by Ed Preston. Part 1 was published in the May 2014 issue of PHB; Part 2 was published in the June 2014 issue of PHB; and Part 3 was published in the July 2014 issue of PHB. P art four of a three part series? I never intended for "The Truth About Oil" series to go on this long, but the false and misleading information seems to never go away. Here is one more installment that (I hope) will lend clarity to some prevalent misconceptions about zinc. "How much zinc is in your oil?" is a poor question to ask. 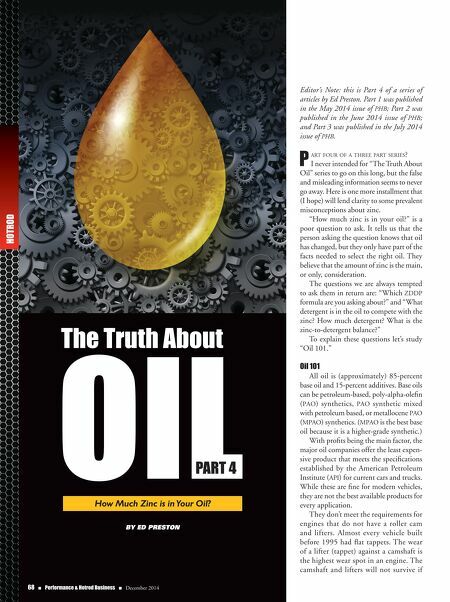 It tells us that the person asking the question knows that oil has changed, but they only have part of the facts needed to select the right oil. They believe that the amount of zinc is the main, or only, consideration. The questions we are always tempted to ask them in return are: "Which ZDDP formula are you asking about?" and "What detergent is in the oil to compete with the zinc? How much detergent? What is the zinc-to-detergent balance?" To explain these questions let's study "Oil 101." Oil 101 All oil is (approximately) 85-percent base oil and 15-percent additives. Base oils can be petroleum-based, poly-alpha-olefin (PAO) synthetics, PAO synthetic mixed with petroleum based, or metallocene PAO (MPAO) synthetics. (MPAO is the best base oil because it is a higher-grade synthetic.) With profits being the main factor, the major oil companies offer the least expen- sive product that meets the specifications established by the American Petroleum Institute (API) for current cars and trucks. While these are fine for modern vehicles, they are not the best available products for every application. They don't meet the requirements for engines that do not have a roller cam and lifters. Almost every vehicle built before 1995 had flat tappets. The wear of a lifter (tappet) against a camshaft is the highest wear spot in an engine. The camshaft and lifters will not survive if The Truth About OIL By Ed PrEston 68 n Performance & Hotrod Business n December 2014 PArT 4 How Much Zinc is in Your Oil?